The Turner family has just got a monster, and the whole neighbourhood is in awe of his superhero stature, daredevil skill and all-round usefulness. Everyone wants their own monster. But sometimes the monster you order isn't necessarily the monster you get. The Turner family has just got a monster, and the whole neighbourhood is in awe of his superhero stature, daredevil skill and all-round usefulness. Everyone wants their own monster. 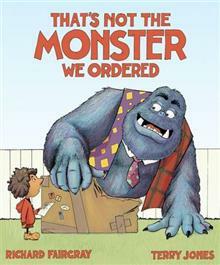 But sometimes the monster you order isn't necessarily the monster you get ... Acclaimed comic writers Richard Fairgray and Terry Jones have once again created a picture book that's bursting with wacky humour and clever illustrations. That's Not the Monster We Ordered will have kids clamouring to get their own monsters, too! There are no reviews for this title. Richard Fairgray (Author) Richard Fairgray is a NZ writer and illustrator who works on comics, picture books and screenplays. He has been publishing work since he was seven years old, and has more than 200 titles to his name. A former teacher and stand-up comedian, and a self-confessed workaholic, Richard's deep-seated fear that he may be a fictional character only serves to drive him harder. He insists that if he doesn't get enough done he'll have to come back as a ghost to finish off. Terry Jones (Author) Welsh-born Terry Jones has written magazine articles, text books, two YA novels and numerous comics as well a slew of unfinished sci-fi and thriller manuscripts. Since retiring early from teaching to write full time, he has produced everything from children's books to screenplays, plus at least one graphic novel a year. Terry immerses himself in digital media and is never more alive than when critiquing Silver Age Superboy stories or linking Twilight Zone episodes to sure signs of a crumbling society. He lives in Auckland.